The B&B season that is. For us here at Oldfarm, it officially kicked off for 2019 a couple of weeks back, and we’ve just been through a couple of busy weekends. And, of course, are looking forward to many more busy days and nights. In the period between Christmas and the beginning of March we took time to re-evaluate at various levels. We tried out new recipes. As we had dinner ourselves, or shared with others, if a new dish received approval, it was always followed with ‘could we serve this to guests’? Lots of new dishes have been added to the repertoire. We’ve added Keto-friendly recipes, vegetarian and even mastered a few new vegan options. There have even been a few dairy, nut and gluten free desserts added to the mix. I may even share a few recipes on here. We have worked hard on your behalf! Another task that was undertaken during the ‘quiet’ months, was a bit of a revamp. We’ve added a ‘new’ room to the mix. What used to be my study, is now available as the Library Room, and I must admit I love the look of it. It has received a major thumbs up from those who’ve already stayed there. The twin room (should we think of a more special name for this room?) has also had a bit of a make over. We hope you like the look. All this revamping means that we can now accommodate 6 people. In other behind the scenes news…. planting season has also arrived, so we are feverishly working in the tunnel and outside in the garden, to guarantee fresh produce for your visit. So, I guess, the question is…. when are you coming to visit? Just in case you want to come… you can book directly (with no hidden fees) right here. Summer 2016 has been our third summer of hosting on AirBnB, and has, in fact, been quite different to previous years. Our guests have typically been mainly from the USA, however, this year our guests were mostly European – mostly either German or English. We did have a chat with those US guests who did come to stay, about ‘why’ Americans weren’t travelling. We thought it might be because of the election. However, they said that a lot of Americans are worried about terrorist attacks in Europe and this is why they are not travelling. We haven’t had the chance to travel this year, but I do wonder do Irish people consider terrorist attacks when travelling in Europe? Perhaps one of the most interesting conversations I had with guests was based around food! Are you surprised? Developed in partnership with Fáilte Ireland the newly published research examines the perceptions of over 2,500 travellers in ten countries including Ireland. 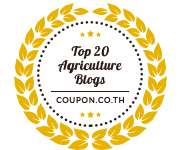 The research also showed that food is now an essential part of the overall visitor experience with 93% of those surveyed reported participating in a food activity on a recent trip. This tells us that the pursuit of a unique and memorable experience is on the rise. While 66% of holidaymakers rated food as important in their overall experience of Ireland this increased to almost one in four (78%) amongst food travellers. Well guys if food is ‘part of the overall experience’ we, as a nation, need to step up to the plate quite a bit to cater for vegetarians! Yes, can you believe it, here I am living on a farm where we produce free range pork products and I am asking the Irish nation to improve their vegetarian offerings. Our guests, a young German couple with their 4 year old son, spent a fortnight travelling around Ireland, staying in B&B’s and eating out. (Yes, it does surprise us that vegetarians choose to stay with us.) When I asked what was the vegetarian ‘choice’ like on their travels …. the answer….. soup, pasta or chips. Come on folks, you can do better than this. For dinner I made Parmigiana with our own aubergines which they totally enjoyed. My homemade granola and our own eggs for breakfast the next morning were also a big hit. It was the first time they had been offered eggs for breakfast. I don’t have a huge repertoire of vegetarian options…. but I can certainly do better than soup, pasta or chips! I am sure others could to. A beautiful colour combination but was this going to taste good? Well truth be told, it was so so delicious we devoured it before I got a chance to take a photograph of the cooked result! We’ve had a really great crop of spinach this year from the polytunnel which we have enjoyed in salads all summer long, neither of us being big fans of the cooked variety! But on one of those recent more chilly evenings it was appropriate to have a ‘hot’ vegetable. As always it was a kind of ‘what’s in the fridge’ moment. 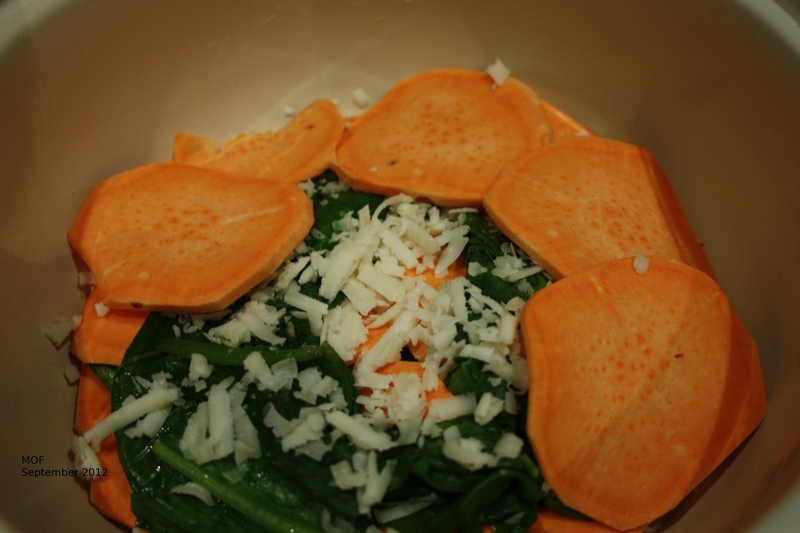 So there was sweet potato, and there was cheese, and we had spinach. Somewhere, and now I can’t remember where or when, I think I saw a combination that was sweet potato and spinach…. but then again with the way the memory is going at times it might well have been squash and spinach….. This is what I did… and as I say it was deliciously yummy! I decided to wilt the spinach in a little olive oil in a frying pan. Arrange the slices of potato on the base of dish. Add layer of the wilted spinach and a sprinkling of cheese and black pepper. Continue with layers, using all up and finishing with potato layer on top. Pour enough milk in to bring it to approx. two-thirds of way up dish. Top off with lots of grated cheese, and a light grating of nutmeg. Back in oven at 180 deg. for about 25 – 30 minutes.